Following table is updated with my original research. And so years: 1993, 1994, 2002, 2003 ad 2004 are different from those based on other sources and are most up-to-date. Currently year 2001 is being researched as up to this point it was only done selectively in search of limited editions only. Rest of the table is still based on current publications and therefore will be subjected to change when and if there are any differences in results. With selective 2001 year and complete 2002-2004 years researched, I was able to compile limited editions numbers and phase 3 register so far. 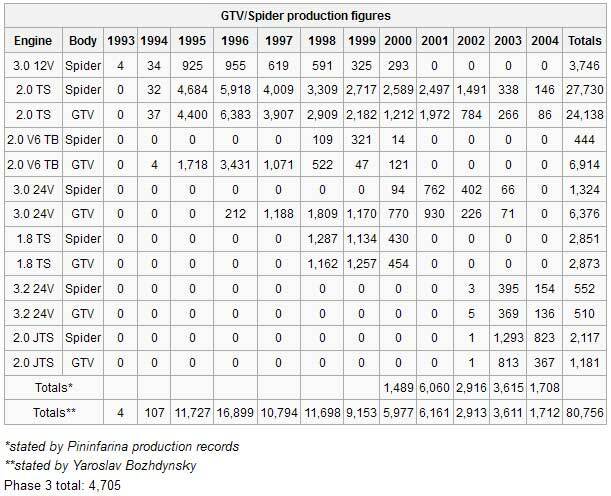 Total count: 41,992 GTV and 38,764 Spider produced. Phase 3 total count: 4,705 units. Meccanizzazione Peugeot 306 Cabrio e Alfa Romeo Spider GTV. Coupé e 12.151 Mitsubishi Pajero Pinin, per un totale di 41.471 vetture. Mitsubishi Pajero Pinin, per un totale di 26.786 vetture. Da settembre 2000 produzione di 9.057 scocche meccanizzate per la Peugeot 306 Cabrio. Pinin e 23.575 Ford Streetka, per un totale di 43.279 vetture. Pinin e 8.561 Ford Streetka, per un totale di 22.868 vetture.